About the time of the shutting up of the shops soon after sunset, a man passed along the Main street beating a drum and informing the inhabitants of the fact, that the Gaspee was aground on Namquit Point, and would not float off until 3 o'clock the next morning, and inviting those persons who felt a disposition to go and destroy that troublesome vessel, to repair in the evening to Mr. James Sabin's house. When Lindsey arrived with the news, a muster was made, and somebody set Daniel Pearce, a boy who had a drum, to beating through the street, and proclaiming that the Gaspee was ashore high and dry below Pawtuxet. In the Pictoral Field Book of the Revolution by Benson J. Lossing,, Volume I, Harper Brothers, New York, 1859, Lossing also cites that the drummer's name was Daniel Pearce. Lossing, during his trip to Providence had extended conversations with eyewitness John Howland at the RI Historical Society. Catharine Williams, in her Biography of Revolutionary Heroes: Containing the Life of Brigadier Gen. William Barton and Also of Captain Stephen Olney. (New York, Wiley & Putnam, 1839), retelling the story of the burning of the Gaspee, we feel, misidentifies the drummer as a Daniel Price. The Saturday Evening Post of August 22, 1829 (Philadelphia, Vol. VIII-Whole No. 421), on the other hand, gives a totally different name to the drummer, as Peter Crooch. The name is previously unknown to us, and the very extensive character description reminds us of someone attempting to write in the style of Charles Dickens. Perhaps the reporter was attempting to impress his editors more than to strive for historical accuracy. We note that the 6June1772 and 12June1773 editions of the Providence Gazette published the names of appointees to town positions, of which, Town Cryer was Mr. Daniel Branch. The simple fact that Daniel Branch was the appointed Town-Cryer does not make him the one that beat the drum to the Gaspee, but the single syllable name similarity certainly gives one pause. Finally, James Otis-Kaler, in his fictionalized tale, When We Destroyed the Gaspee, (1901): Boston, D. Estes & Co. Library of Congress # 01018525 uses the name of Daniel Pearce as one of the main characterizations along with Justin Jacobs. 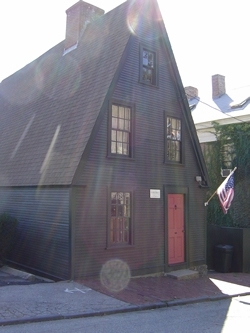 Left: Daniel Pearce House (c1781) still stands at 53 Transit Street in Providence, noted by its steep "lightning splitter" roof. We do note that a Daniel Pearce and his wife both died of yellow fever in Providence in September 1800 (Field. Edward. State of Rhode Island and Providence Plantations at the End of the Century: A History. Boston, Mason Publishing Co, Vol II, p35). We note that 52 Providence citizens died in that epidemic, all South of Transit Street. In the Life and Recollections of John Howland, the author relates that these periodic summer epidemics of yellow fever were predominant in the South area of town (near Fox Point), which would be expected since we now know that this disease is transmitted by mosquitos, probably imported to us from the many merchant ships that traded with trhe Carribbean and South America, and which were known to have docked at Fox Point. We also know that Daniel Pearce's house was on Transit Street, and that is smack in the middle of the South part of that town.. It also would be a close location to the Providence wharves in 1772. The RI Historical Society papers of William Greene (MSS 470) indicate that while he was in the merchant partnership of Greene & Sarle, they contracted Eben Marvin and Daniel Pearce to build the brig Catharine Ray. We see from the United States Chronicle [Providence] of 11June1789 that Daniel Pearce was appointed a constable of that town. There were two young ladies married after the turn of the century that were cited as daughters of the 'late Daniel Pearce', including Fanny (1801), and Ann (1805) In 1807 the house of the 'late Daniel Pearce' located on Transit Street was sold at auction. Wayne G. Tillinghast in The Tillinghasts in America: The First Four Generations (2006), cites a Daniel Pearce who was the son of William Pearce ( ___--1784) and Elizabeth Tillinghast Pearce (1718-1761). This Daniel became a tailor according to a relative's probate records in 1776. Unfortunately, we don't have more exact vital records other than by extrapolating his mother's dates, so this Daniel Pearce was presumably born sometime after 1734 and before 1761. Also of interest is that WGT indicates than William Tillinghast was an innkeeper. We find ads in the 1763 Providence Gazette for the sale of a large house on the Pawtuxet Village waterfront suitable as an inn or for shipbuilding, and which was apparently co-owned by William Pearce and James Rhodes. The Providence house of William Rhodes was notable enough to have been a landmark used by several ads in the Providence Gazette, including one 1773 ad to meet and organize for the erection of a bridge connecting Providence with Rehoboth (now East Providence). We note that Daniel Pearce is variably referred to as a 'boy' and 'man' in the retellings of the Gaspee Affair above. John Howland called him a boy, and John Howland was known to have become an astute historian, even President of the RI Historical Society. Howland's own age at the time, put him close to the age of Daniel Pearce himself, so the c1756 birth age we have selected for our Daniel Pearce seems about right. No Daniel Pearce of the right dates appears in the RI Historical Cemetaries Database, but there is a Pearce family plot in East Greenwich. The 1770 List of Providnce Taxpayers does give a Benoni Pearce living in section XI C 5 of the map, just West of the Great Bridge on Broad Street Comprehensive offspring records of Benoni do not list a Daniel Pearce. Very little else in known about Daniel Pearce. Ancestry.com gives us a Daniel Pearce born 3 MAR 1752 in East Greenwich, RI died 12 FEB 1824. But we also know that our Daniel Pearce died in 1800, so this man is not him. Our conclusion is that the Daniel Pearce we seek is probably born and raised in Providence. It really matters not that we can't track his ancestry. We know he existed, he was named in first person accounts of the attack, and we know he died in 1800. Since he was a boy in 1772 we can assume his birth year was about 1750-1759, and most probably he was the son of William and Elizabeth Pearce. While Daniel Pearce may or may not have directly participated in the attack on the Gaspee, he did encourage others to do so. We therefore recognize him as an unindicted co-conspiritor in the Gaspee Affair.